Graytronics was formed in 1987 by Bob Gray, producing intercoms for rally cars and offshore powerboat racing; they soon became the choice for almost all of the offshore racing teams. Shortly afterwards Graytronics were approached by the Ministry of Defence, after successful sea trials Graytronics were supplying intercoms for the Royal Navy RIBs and fast interceptor crafts. Due to the increased demand from the MOD and other defence agencies, the production of powerboat racing intercoms was put on hold. As Graytronics grew Nathan Ablott joined the company in 2004 as an engineer, after a few years with Graytronics Nathan looked into starting production of the powerboat racing intercoms again. 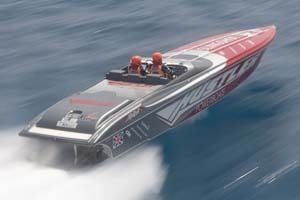 Shortly afterwards Graytronics came up for sale and as Graytronics was sold to Ultra SML Technologies, Nathan was able to acquire the technology licence for the Graytronics Powerboat Racing Intercoms and so Boat Intercoms Ltd was formed in 2008 . With the knowledge and skills gained at Graytronics making systems for a wide variety of water based agencies Nathan is now ready to revive the powerboat intercom market under the name Boat Intercoms Ltd based at Burton upon Stather in North Lincolnshire.